Home Bathtub Refinishing How Long Will Our Finish Last? With proper care and maintenance, refinishing can extend the useful life of your fixtures for up to 15-20 years or more. In fact, we've been around long enough for many of our customers to tell us that their bathtubs still look and feel great after more than 15 years. Our technologically advanced coatings are designed to stand up to daily use and do not require special care. 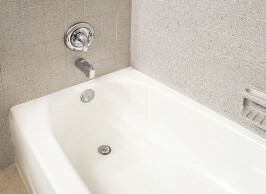 However, like a newly manufactured bathtub, a refinished surface can be chipped or scratched if it is abused. No surface lasts forever. Even porcelain will become dull and worn after 20 years with normal use. Similarly, our finish on your bathtub may lose some of its gloss and shine at some point. The good news is that when that happens we can once again extend the useful life of your tub and refinish it at a fraction of the cost of replacement.